In differential protection scheme, the current entering at one end of the line and leaving from other end of the line is compared. The pilot wires are used to connect the relays. Under normal working condition, the two currents at both ends are equal and pilot wires do not carry any current, keeping relays inoperative. Under fault conditions, The two currents at two ends are no longer same, this causes circulating current flow through pilot wires. This causes relays to trip which operate the circuit breakers to isolate the faulty section. The Fig. 1 shows Merz-Price voltage balance system used for the three phase feeders. Under normal condition, current entering the line at one end is equal to current leaving from the other end. Thus equal and opposite voltages are induced in the secondaries of C.T.s. at the two ends. Hence no current flows through relays. Under fault condition, two currents at the two ends are different. Thus the secondary voltages of the two C.T.s also differ. This circulates a circulating current through the pilot wires and the relays. Thus the relays trip the circuit breakers to isolate the faulty section. 1. Can be used for parallel as well as ring main system. 2. Provides instantaneous protection to the ground faults. 1. The C.T.s used must match accurately. 2. The pilot wires must be healthy without discontinuity. 3. Economically not suitable as the cost is high due to long pilot wires. 4. Due to long pilot wires, capacitive effects may affect the operation of the relays. 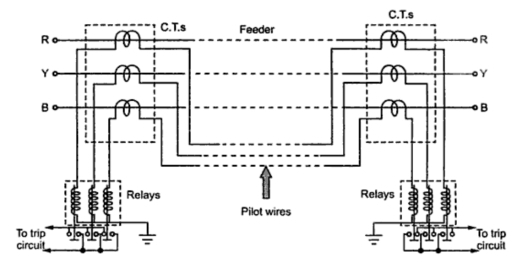 The translay relay is another type of differential relay. The arrangement is similar to overcurrent relay but the secondary winding is not closed on itself. Additionally copper ring or copper shading bands are provided on the central limb as shown in the Fig. 2. These type of relays are used in the feeder protection and the scheme is called Translay scheme. 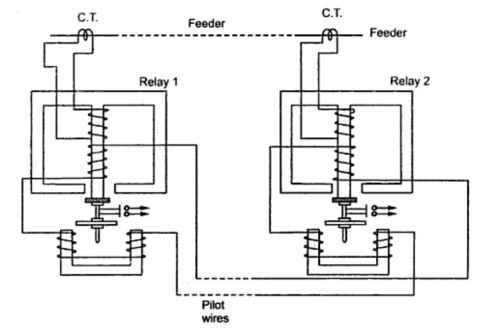 In this scheme, two such relays are employed at the two ends of feeder as shown in the Fig. 3. The secondaries of the two relays are connected to each other using pilot wires. The connection is such that the voltages induced in the two secondaries oppose each other. The copper coils are used to compensate the effect of pilot wire capacitance currents and unbalance between two currents transformers. Under normal operating conditions, the current at the two ends of the feeder is same. The primaries of the two relays carry the same currents inducing the same voltage in the secondaries. As these two voltages are in opposition, no current flows through the two secondaries circuits and no torque is exerted on the discs of both the relays. When the fault occurs, the currents at the two ends of the feeder are different. Hence unequal voltages are induced in the secondaries. Hence the circulating current flows in the secondary circuit causing torque to be exerted on the disc of each relay. But as the secondaries are in opposition, hence torque in one relay operates so as to close the trip circuit while in other relay the torque just holds the movement in unoperated position. The care is taken that at least one relay operates under the fault condition. Role of copper ring : Mainly relays may operate because of unbalance in the current transformers. The copper rings are so adjusted that the torque due to current induced in the copper ring due to primary winding of relay is restraining and do not allow the disc to rotate. It is adjusted just to neutralise the effect of unbalance between current transformers. The copper rings also neutralise the effect of pilot capacitive currents. Though the feeder current is same at two ends, the pilot capacitive currents may allow in the pilots. This current leads the secondary voltage by 90o. The copper rings are adjusted such that no torque is exerted on the disc, due to such capacitive pilot currents, by adjusting the angle between the induced current in the disc and secondary current to be 90o. 1. Only two pilot wires are required. 2. The cost is very low. 3. The current transformers with normal design can be employed. 4. 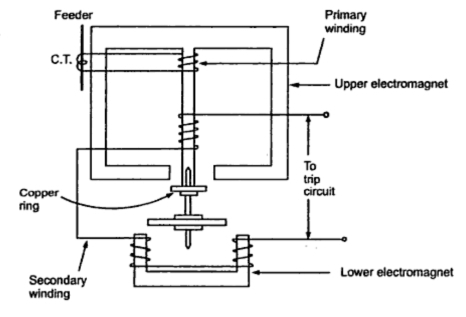 The capacitive effects of pilot wire currents do not affect the operation of the relays. where should "feeder wires" be protected from the main panel to the sub-panel?